Last week, Kenya's lawmakers agreed to draft a bill that would withdraw the country from membership in the international criminal court, situated in The Hague, Netherlands. 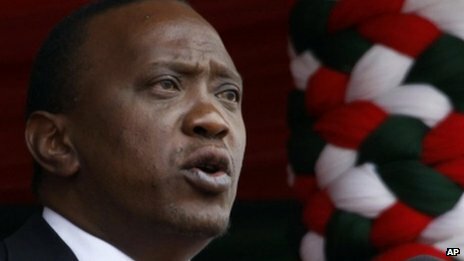 The motion was approved by the allies and party of the country's current president, Uhuru Kenyatta, who is scheduled to face trial in that court by the end of the year for crimes against humanity based on, as the BBC describes it, "the disputed elections in 2007, in which more than 1,000 people were killed and 600,000 forced from their homes." His Deputy President William Ruto is also being tried. Both winners of the most recent Kenyan presidential election have combined their supporters into a "Rainbow Coalition" in the current Parliament. The article continues, "MPs from the opposition Coalition for Reforms and Democracy (Cord), led by former Prime Minister Raila Odinga, walked out of the debate, calling the motion "capricious" and "ill-considered". Kenya's withdrawal would not bring "honour to the nation and dignity to our leaders", Cord said in a statement. "Kenya cannot exist outside the realm of international law," it said." This would be the first country to withdraw its ratified support for the ICC. Still this is not Kenya on its own. The BBC article goes on, "In May, the African Union accused the ICC of "hunting" Africans because of their race. The ICC strongly denies this, saying it is fighting for the rights of the African victims of atrocities. The ICC was set up in 2002 to deal with genocide, crimes against humanity, war crimes and the crime of aggression. The court has been ratified by 122 countries, including 34 in Africa. 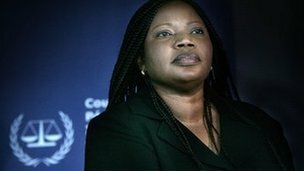 It is even more ironic that the ICC's Chief Prosecutor is Fatou Bensouda, from The Gambia who took over the position after the first prosecutor had served a 9 year term. According to other accounts, in 2011, the African Union strongly supported and lobbied for Ms Bensouda, hoping for a more evidently fairer to wider selection of cases to pursue. So this is all rather murky, and certainly under-reported. AllAfrica.com - a news service - has plenty of details on the case. Noting that President Kenyatta has asked for postponements 4 times, requested a change of venue from The Hague, and in some ways, his legal counsel seems to be turning the protocols inside-out to avoid or postpone the proceedings. The Washington Post did run an editorial back in May, 2013, noting the following. "Almost 15 years ago, delegates from more than 100 countries gathered in a crowded conference room in Rome, cheering, chanting and even shedding a few tears. After weeks of tense negotiations, they had drafted a charter for a permanent court tasked with prosecuting genocide, crimes against humanity and war crimes around the world. Kofi Annan, then U.N. secretary general, cast the new International Criminal Court in epochal terms: “Until now, when powerful men committed crimes against humanity, they knew that so long as they remained powerful, no earthly court could judge them.” That earthly court is now rooted. Its glassy headquarters on the outskirts of the Hague houses more than 1,000 lawyers, investigators and staff members from dozens of countries. Judges hail from all regions of the world. But for an institution with a global mission and an international staff, its focus has been very specific: After more than a decade, all eight investigations the court has opened have been in Africa. All the individuals indicted by the court — more than two dozen — have been African. Annan’s proclamation notwithstanding, some very powerful people in other parts of the world have avoided investigation." "Great-power politics are the key here. China has a veto over Security Council action and wants the court to stay well away from North Korea, for instance. Russia will not permit an ICC investigation in Syria. And when violence in Iraq was at its most intense, the United States would have blocked any move to give the court jurisdiction there. A stray comment by an Iraqi minister in 2005 suggesting that the country might join the ICC produced nervous phone calls from U.S. diplomats. They got the assurances they wanted: Baghdad would not become a member. Afghanistan is the most glaring example. Thousands of civilians have been killed in that country since the court began operating, most by the Taliban and other extremist forces but also by NATO troops and aircraft. The court has not moved to investigate. The ICC also stayed out of the 2008 Russia-Georgia conflict, which produced thousands of deaths and injuries and well-documented war crimes. It has not opened a full investigation of rebel and paramilitary violence in Colombia. The prosecutor’s office has moved extremely cautiously on accusations against Israel by the Palestinians, who attempted to give the court jurisdiction in 2009. Still fragile, the ICC has no desire to provoke Washington, Beijing or Moscow. A full-blown confrontation with a major power could threaten the court in ways that tussles with Sudan and Kenya do not. It’s not so much that the court is biased against Africa as that it is reluctant to meddle in cases in which the geopolitics are intense. But the result is the same: stricter justice for one part of the world." Teatree remains unclear about the ICC focusing only on African cases. How separate is the ICC from an international war crimes tribunal for Yugoslavia, the ICTY - also based in the Hague - that prosecuted several leaders of the Balkans War. A lot of careful stepping and avoidance of snap judgements is probably needed.